From our regular locations (above) to hot spots around the city, our truck is the little engine that can turn out delicious dogs with sides of Sue's signature smile. Follow letsbefrank on Twitter to find where the trailer will be next! 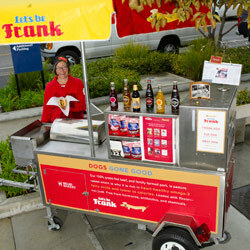 We also have festive umbrella -topped carts that can be wheeled almost anywhere to serve up Frank’s fare. We can tow a cart to your backyard party, parking lot…or any other outdoor event! 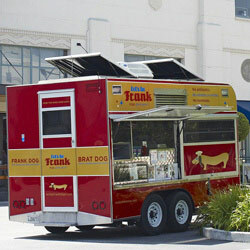 Please check our catering page or contact lacatering@letsbefrankdogs.com to find out more about having our cart at your next party.